There are three main skin types – oily, sensitive and combination. And, while other factors such as age and genes can influence the quality of your complexion, understanding your skin type and treating it accordingly can go a long way to achieving a radiant visage. Oily skin is caused by the production of excess oil in the pores. Fluctuating hormones can stimulate these sebaceous glands in the skin to produce more oil. This why people with oily skin tend to suffer most during their teenage years or in times of stress. So how can you tell if you have oily skin? If you have a fringe, you may notice that this becomes greasy quickly after contact with your skin. You may have enlarged pores in your t-zone. And, you may experience regular breakouts. This is because the over-production of oil can lead pores to become blocked and this in turn causes spots and acne. Make sure to wash your face thoroughly twice a day. A liquid cleanser helps to prevent the build-up of excess oil, daily grime and skin debris which can clog pores and lead to spots. Try not to touch your face too often during the day. Your fingertips house bacteria and dirt which can exacerbate any skin problems. Touching your face also spreads the oil around. Keep hands clean and away from your face. It is tempting when you have oily skin, to wash your face more than twice a day – but this does more damage than good. Excessive washing dries out the complexion causing redness and irritation. It is important to remember that oily skin still needs to be hydrated. Do not forgo your moisturiser entirely! 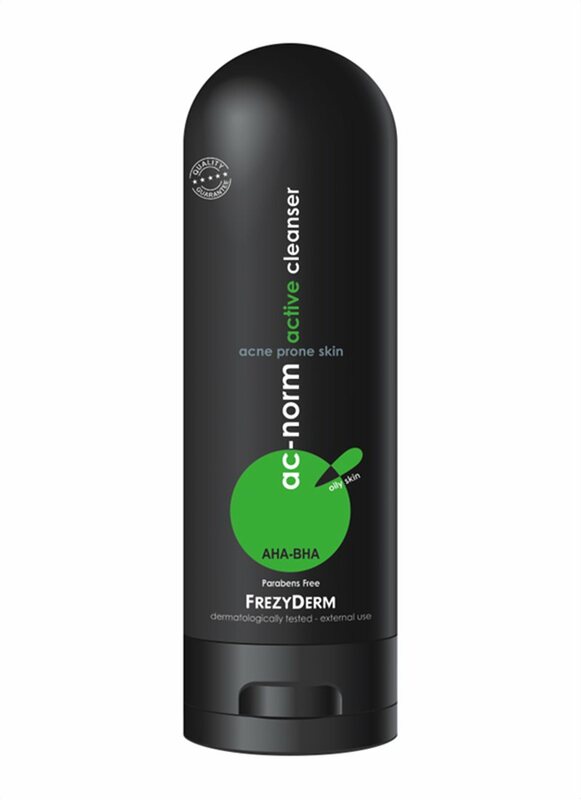 At FREZYDERM, we have a range of products specifically designed for acne-prone skin. They are delicate on the complexion and tough on spots. Our Ac-Norm Aquatic Cream replenishes thirsty skin while simultaneously blotting out excess oil. Why not request a sample today? If you have acne, it is hard to steer clear of make-up entirely – although foundation can often make the problem worse. Look for oil-free products and try to go bare faced whenever possible to give your pores a chance to breathe. Greasy foods are not the main cause of greasy skin. But it is important to feed your complexion with vitamins and minerals so that your skin can adequately repair itself and bounce back from an acne flare-up. There is a direct correlation between hormones and acne. Mood swings, stress and anxiety can all result in pretty violent skin breakouts. To keep your complexion – and your soul – on an even keel, why not try yoga or meditation to fully unwind. Make sure to get plenty of sleep too, so your body can switch off and relax. At FREZYDERM, we have everything you need to keep your oily skin in check. Browse our range of spot-busting products below.